Links from other websites are essential for search optimization and improving your website’s search visibility. However, building worthwhile links is also very difficult and time-consuming, making it easy for some businesses to dismiss as too costly an investment. But the fact remains that links are at the very core of Google’s search algorithm, and if you are interested in search visibility you need to actively pursue links. Let’s take a look at each of these strategies individually. One common link opportunity that a lot of businesses tend to overlook are local associations. Even if you’re a relatively new business, it’s likely you’re involved in at least a few different associations. Make sure to check the associations you’re already a part of to see if they have an existing website, and if they do make sure your business is listed appropriately, with a link. Also, joining more associations might be worth considering as well, as there are typically a number of local associations that have websites and represent more link opportunities. As part of these associations, any links from their websites are both relevant and links you deserve. Another quick way to build some real links is by providing testimonials. Similar to associations, you may already have existing testimonial link opportunities. If you have provided testimonials to companies in the past, and they’ve featured that testimonial on their website, simply reach out to them and see if they would be willing to add a link to your site as a citation for your testimonial. For even more testimonial opportunities, check out this helpful post from Adam Melson. Creating local discounts can be another useful link building tactic. 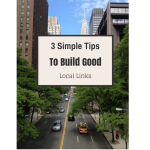 Not only can creating discounts lead to good links that make sense, it can also provide you with a great way to give a little back to your local community. College or government websites (.EDUs and .GOVs) are typically viewed by Google as very trusted and authoritative sites, and links from these websites will often pass significant trust and authority to your own site. You can build links on these sites by creating discounts. To build .EDU links, create discounts for the students, faculty, or staff of the local colleges in your area, and then reach out to these schools and let them know about the discount. If you build a landing page that explains the discount and provides information, oftentimes the universities receiving the discount will include a link to your discount page from their websites. The same strategy can be tweaked to build .GOV links by creating discounts for local government employees. However, make sure you are not creating discounts to be manipulative. You should be offering viable discounts that actually provide value to the people receiving them. Traditionally, link building is very difficult. Link building is often an ongoing investment into the future, and it takes time and dedication. While there are no shortcuts in link building and SEO, there are still a few solid strategies you can implement to build some good links that make sense for your site. This article was written by Andrew Dennis from Business2Community and was legally licensed through the NewsCred publisher network.